HANOVER, MASS., US, November 6, 2018 /EINPresswire.com/ -- Starting in the early '90s when the first pair of Augspurger monitors helped make Manhattan's Unique Studios the home of hip-hop and R&B, Augspurger has played a key role in crafting the sound of New York's best studios across multiple genres. Powering the studios of notable artists including Jay-Z, Alicia Keys, Snoop Dogg and Coldplay; Grammy-winning mix engineers and producers Dave Pensado, Rafa Sardina and Rik Simpson; plus Grammy-nominated engineer Jean Marie Horvat and producer-multi-instrumentalist ZEDD, Augspurger is proud to welcome Times Square's recently built Grey Noise Studios, South Bronx' Polo Grounds and Brooklyn's Electric Garden to the Augspurger family. Each Augspurger system is meticulously tuned to the company's decades-in-the-making reference mix curve, which ensures compatibility between other Augspurger-equipped studios around the world, such as NYC's Leila's Playground, Blast Off Studios, Atlantic Records, Quad Studios, Premier Studios, Penthouse Studios, House of Hits, Addicted to Mullah and Mix Pack Records. By matching the response curves from studio to studio, clients can work in any Augspurger room worldwide, and trust what they're hearing—even at high levels when feeling the music is equally crucial. 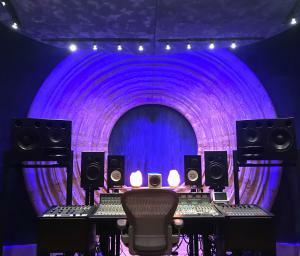 Grey Noise Studios features two control rooms with the 8,200-watt Duo15-Sub218 system, in Studio A, and a pair of 3-way active Treo 812CFM close-field monitors in Studio B. The two studios can be booked together with two additional writing rooms. Grey Noise caters to NYC hip-hop, pop and production-oriented music. Not just for seasoned pros, Grey Noise has a mission to empower up-and-coming musicians with artist development by Christina Chirumbolo, who has nurtured many young and talented artists. Polo Grounds also has two control rooms, with Studio A featuring Augspurger's 8,200-watt Duo12-Sub18 System and a pair of 3-way Treo 812CFM close-field monitors in Studio B. Polo Grounds is the record label headed by Bryan Leach, home to artists such as Pitbull, A$AP Rocky, and A$AP Ferg, plus many other top hip-hop artists. 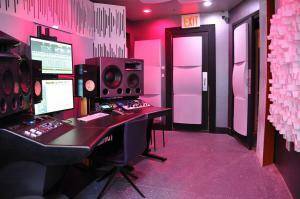 The facility caters to the label's artists who are veterans of Augspurger-equipped NYC studios but wanted the Augspurger sound and experience for their in-house productions. Electric Garden is a commercial studio focused on hybrid production, combining live instrument recording with electronic music creation. 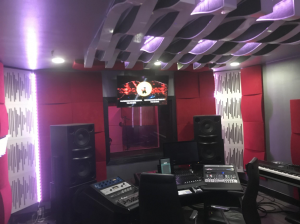 The control room has the Treo812CFM monitors, plus there's a large tracking room with isolation spaces where they focus on Jazz and Indie Rock, as well as other genres. It's in an incredibly creative space that's as cool as its location in Williamsburg—just across from world famous Peter Luger steakhouse under the bridge! Augspurger is a professional monitoring system company based in Hanover, Mass., which focuses on full range, horn-loaded main monitoring systems that have DSP-controlled power amps for tuning the system to the room, natural phase linearity, extremely low distortion, defined low frequency from 20 Hz and almost unlimited power with incredible imaging clarity at any level. For additional information contact Bruce Bartone, Sales Director, at bruce@augspurger.com.